On Jan. 30 it was announced that John Wall would undergo a minor knee surgery and miss the next 6-8 weeks. After Wall left the lineup, the Wizards won their last two games of January and followed that up with an 8-4 February. The team’s strong response to losing their leader elicited some mild rumblings from the internet that perhaps Washington was better without Wall -- an idea that is ludicrous on its face. No team would be better off without an All-NBA talent like Wall. What the Wizards were without him was different, something that could be useful as Washington makes their way into the playoffs. When he is on the court, Wall is one of the most ball-dominant players in the league. He passes plenty -- nearly two-thirds of his touches end with a pass, and he’s second in the NBA in potential assists per game. But Washington’s offense also ran with the ball in his hands a lot -- Wall is third in the league in time of possession per game and had the second-longest average touch time. With Wall out of the lineup, Washington had to adapt, replacing Wall’s effective but high-usage point guard orchestrations by sharing the responsibility. The result was a lot more movement, both of players and the ball. 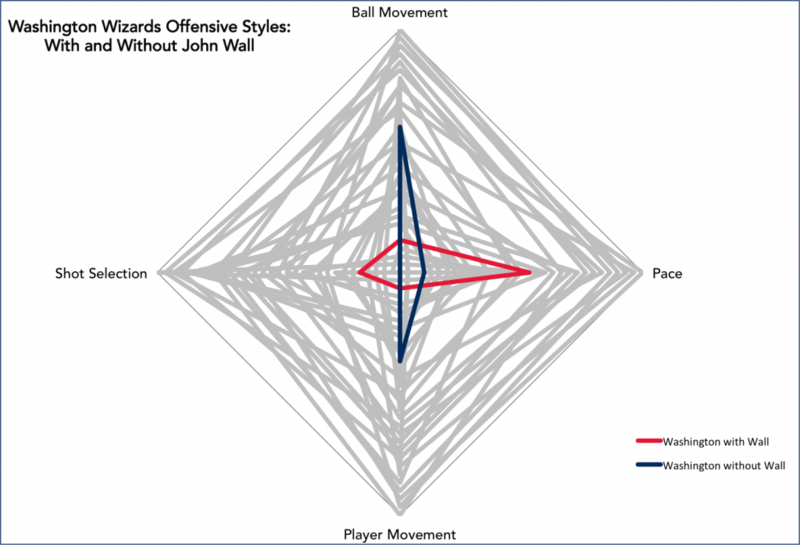 The graph below shows the offensive style the Wizards employed with John Wall through Jan. 25, and then during his injury recovery. The style is charted on four axes -- shot selection (high percentage shots – 3s and layups), ball movement (average touch time), player movement (offensive distance traveled per minute of possession) and pace. The greyed out lines represent the other 29 NBA teams this season. The further a point is from the center on each axis, the more of that element was incorporated by the team. It’s important to remember that none of these things by themselves objectively represent good or bad offensive principles. The Houston Rockets have one of the best offenses in NBA history and they rank near the bottom of the league in both player and ball movement. The Minnesota Timberwolves are also a top-five offense this season and they rank no higher than the 33rd percentile in any of these four stylistic categories. We can see here how the Wizards compensated for Wall’s absence by slowing the pace and doubling-down on movement in their half-court sets. Their offense was actually slightly more efficient in the time Wall was out, averaging 108.4 points per 100 possessions compared to 106.3 in the time before his knee surgery. However, they left a lot of easy points on the table by veering away from the things they did well when Wall was in the lineup. Wall’s ability to force turnovers and push the ball in transition was one of the reasons the Wizards ranked ninth in the league in points off turnovers per game, at 17.4. In the time Wall was out, the Wizards dropped to 15.9. They also scored a slightly lower percentage of their points at the free throw line and, for all the increased ball movement, didn’t see a significant uptick in the number of open 3-pointers they saw per game. Wall’s drive-and-kick game (sixth in the league in drives per game, second in the league in assists off drives per game) is a tool Washington can rely on in the playoffs when defenses tighten up. He’s also in the 64th percentile as an isolation scorer this season and ranks third in the league with 5.2 transition possessions per game. Having his ability to push the ball and augment some of the elements they’ve incorporated in his absence makes Washington stronger and more versatile, a team that should be harder to guard in the playoffs. In addition, Wall’s absence has allowed Washington to get an offensive rhythm with Tomas Satoransky, who filled many of the point guard minutes over this stretch. Before Wall went down, Satoransky had played very few minutes with lineups heavily featuring players at the top end of Washington’s rotation. While Wall was out, Satoransky played 478 minutes with Bradley Beal, Otto Porter Jr., Markieff Morris and Marcin Gortat, putting up an average of 114.6 points per 100 possessions and outscoring opponents by 9.8 points. He also played 82 minutes in an interesting small-ball lineup with Beal, Porter Jr., Morris and Kelly Oubre Jr. that blitzed opponents by 27.1 points per 100. All of this experience working together should make Washington’s depth that much more effective in the postseason. Wall has been up and down in the two games since his return but tonight’s matchup could be an excellent example of how adding Wall to some of the new movement-based elements the Wizards have leaned on in his absence could make the team more dangerous in the playoffs. Cleveland is a very likely first-round opponent for the Wizards and this is a nice late-season opportunity to work on reintegration in a useful context. The bottom line is that the Wizards are better off with Wall on the floor. Given what they’ve learned while he was out, the difference could be significant.